We recently learned some interesting finding for back to school with a new survey from Dell that reveals insights about how families communicate and make purchasing decisions around this key technology buying season. The study, conducted by Harris Poll on behalf of Dell, surveyed more than 1,000 respondents from across the country, including 506 students aged 16-19 who are attending or planning to attend a 2–4 year college. 505 of the respondents were parents of this type of student. The study supports that mobile devices, such as tablets, are bridging the distance between students and parents with anytime, anywhere connectivity. This flexibility is also inspiring students to carry ideas outside of the classroom and apply them to their real-world passions and pursuits. The usage habits revealed by Dell’s ‘Where Learning Meets Doing’ survey are grounded in two key trends: a shared preference among parents and students for a versatile device that adapts easily to both work and play, and a desire to have sole ownership over this device – no inter-family sharing! Almost two-thirds of parents (64%) and three-quarters of students (75%) prefer to have one device that can take them through all aspects of their life, whether work or school. And that one device is solely their own – siblings and parents are cautioned to keep their hands off a student’s tech, and vice versa. More than three-quarters of parents (78%) and students (77%) say they rarely, if ever, share their devices amongst each other. As both parents and students prepare for the upcoming school year apart, the Dell survey revealed communications trends and habits of those being separated. The survey indicates that there is a major shift for how parents and children communicate when apart from each other. For parents with a child away at school, over half (55%) are talking with their child less, but communicating more thanks to texting and emailing. Parents who feel nervous at the thought of their child attending school out-of-state can rest assured that geographic distance is not an obstacle to communication, thanks largely in part to mobile devices. More than four in five parents of 16-19 year olds (84%) and nine in ten kids, 16-19 (90%) reported that it’s very easy to stay connected with their families due to all the tech devices they have, whether at home or away. Three in ten parents of 16-19 year olds (30%) and over one-third of kids 16-19 (35%) even admit to texting each other to ask a question while in the same house! Four in five parents whose child is away or will be away (80%) are likely to text more with their child while more than three in five (62%) will video chat with their child. Just one in ten (13%) say they will text less with their child. When it comes to communicating with the child away at school, half say the mode used most often is texting (51%) while less than two in five (38%) say it is talking on the phone. As parents and students prepare for the school year ahead, technology continues to help students achieve more. Dell’s ‘Where Learning Meets Doing’ survey shows that kids are actively using their laptops and tablets to expand their educational horizons and take the next step from learning about a topic to applying their new knowledge to projects or personal interests. Nine in ten of students and their parents agree that the devices available today make learning a lot easier, naturally extending a student’s studies beyond the classroom or library. Mobility is key to facilitating the learning process: over half of the students surveyed say that they study on-the-go, wherever they can grab a few minutes, and over three-quarters of students (77%) have jumped online after class to source more information on a subject. Additionally, seven in ten (69%) have used online “how-to” videos to supplement what they have learned in class, filling in any gaps in comprehension. As high school and college students have a strong opinion about the type of electronics they want to use, the Dell survey looked at key buying preferences among both students and parents. 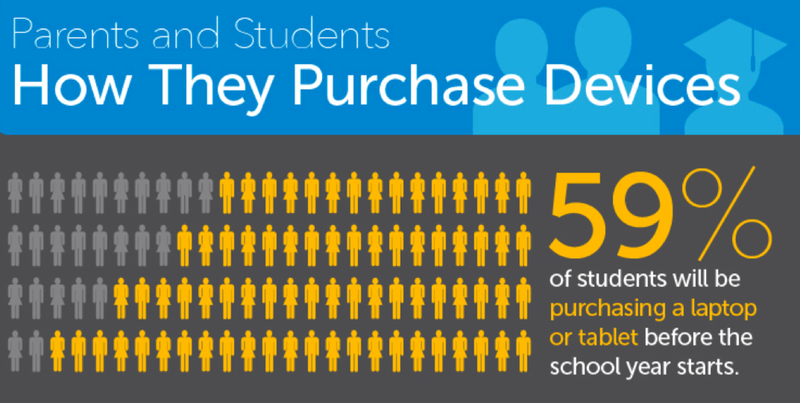 Nearly sixty percent (59%) of students will be purchasing a laptop or tablet before the next school year starts, and among those students who say their parents will be buying their device for them, over half (53%) say they have all or most of the influence on the purchase, while one-quarter (27%) say they have about half the say. Students and parents do differ in terms of who they trust for “expert” buying advice: parents are more likely to look at reviews (83% vs. 64%), while students are more likely to typically look at social media (41% vs. 17%) for information. Students and parents can rest assured that Dell’s newest Venue tablets and Inspiron laptops and 2-in-1 devices will meet the needs of both parties, bringing families within virtual reach of each other while setting students up for success in the classroom and beyond. The survey also found that, of those with a budget, the average a parent plans on spending for a new device is $635. Dell is proud to offer a wide range of products that fit within the budgets indicated in the survey, including many of our newest tablets, laptops and 2-in-1 devices.